The best value and perhaps most appropriate tariff comes in at £15 per-month for 10GB of data. 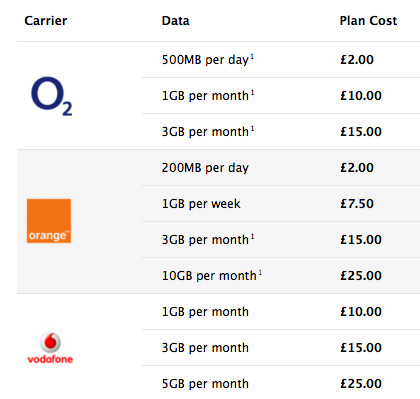 This compares to Orange’s £25 per-month for the same amount of data or £15 for 3GB. That said, there are better alternatives for sporadic iPad 3G usage, such as O2’s £2 a day deal which gives you 500MB and unlimited Wi-Fi via supported hotspots. It’s also worth mentioning, however, that 3’s MiFi mobile wifi hotspot (reviewed here) makes a great iPad companion if you opt for the WiFi-only version of the device and, of course, is that bit more flexible (if a little more clunky) than going down the SIM card route. Interestingly, Apple has yet to catch wind of 3UK’s iPad tariffs. It’s official website only lists the other three operators.